Rumiko Takahashi is one of the most famous and wealthy female mangaka in Japan, authoring such classic and well known series (even to those in the west) such as Inuyasha, Ranma1/2, Urusei Yatsura, and ect. However, one pitfall she is often guilty of falling in to, and one that Kyoukai no Rinne here is not exempt from, is STAGNATION. Now you can have the best concept for a story in the world, but if you don't progress your plot forward or develop your characters, you're going to run yourself into a bit of a rut. Kyoukai no Rinne, as with a lot of Takahashi's other series, start out pretty decently with an alright premise and a colorful and interesting cast of characters. However, Kyoukai no Rinne season 3 is where this series reaches its full Takahashi-brand of stagnation. KnR may even be worse off than a series like Inuyasha because it's entirely focused on comedy slice of life. There's not really a plot or endgame here to drive the characters forward or develop the world. And because there isn't one, the only thing that CAN drive a comedy slice of life series forward is its characters. But unfortunatley by this point, all the characters in this once-charming cast have been dumbed down and reduced to one-note archetypes, mouth pieces that just exist to drop exposition or lame jokes, and mere shadows of their former selves--which is a danger many writers put themselves into when their cast expands to this extent. None of the characters in this series grow, change or develop no matter how many episodes go by, and nothing is made interesting and compelling when everything returns to the status quo by the end of EVERY (yes, every) episode. And all the interesting and unique traits that these characters used to have have now either been lost or clumsily stripped away. Take Juumonji Tsubasa for example. He starts the series out as a regular human who can see spirits like Mamiya Sakura. Unlike her however he comes from a family of exorcists and spiritual mediums. He also has a crush on Sakura and rivalry with Rinne. In season 3 he has been reduced to "HOLY ASH ATTACK!" and exposition man. Nothing more. His crush on Sakura and rivalry with Rinne has only been brought up TWICE in all 25 episodes of this season, and potentially interetsing things about his family background and experiences are never explored. And at this point, every character in this series has become like him: watered down, uninteresting and flat. Basically everyone in this series can be described in one or two character traits at most. Ageha is just a shallow, angry, rich girl (her crush on Rinne, jealously for Sakura, relationship with her Black Cat Oboro, relationship with her sister, or her life as a rich and pampered youth are either hardly brought up or never explored), Shirushigami Kain's sole role at this point just seems to be to tick Rinne off and make him angry (the specifics of his homelife, the loss of his money by Rinne's father, relationship with his Black Cat Suzu, and things about his mother aren't even touched upon) Matsugo exists SOLEY to have a really creepy obsessive crush on Rinne which is played only for laughs and nothing more, while the debateably best designed female character in this series--Anju--only exists to have a crush on HIM. And it goes on and on for every character. When a character enters a scene in this show you know EXACTLY what they're going to do and EXACTLY what is going to happen, because it's the exact same thing that happens every time they are in a scene. Another pitfall Rumiko Takahashi often falls into is reusing and recycling jokes and troupes to the point where beating a dead horse seems like too weak an analogy for it. Every time Rinne's father Sabato shows up, does he have to get hit on the head with Rinne's scythe? Every time Juumonji shows up does he have to throw holy ash at things? Does Rinne's grandmother Tamako really have to grind her knuckles on Rinne's head every time he accidentally calls her 'grandma' (an aside, even if the characters point out that the joke is becoming trite, it doesn't make the joke any less trite) How many episodes are we going to get which center around Rinne coming into sudden, unexpected monetary wealth, only to have it cruely stripped away from him in the end and have him return to a poor breadcrumb eating Shinigami? Now despite how I'm ragging on it, this season isn't all bad. There are a small handful of fun episodes and pretty funny jokes scattered throughout if you're patient and can endure waiting for them (also, if you're reading this you may as well watch the last episode of this season, because it was pretty good as a send off for this series). However, if you're someone like me who found the series charming in its inception and even if it got dumb sometimes, you couldn't help but enjoy it, this season still might be a good place to cut your losses and just stop watching. This season is incredibly fillery with the majority of episodes consisting of 2-3 self contained mini SOL stories, some involving ghosts around the school or the town, or others involving shenanigans in the spirit world. However, as I said before, with flat, lifeless characters experienging these things, there's nothing interesting, fun or compelling about any of these stories, especially when you know everything is just going to go back to the way it was by the end, and that nothing is going to change, develop or grow. Unless you're a super diehard fan of Rumiko Takahashi or this series, feel free to give it a miss or assume the series ended at season 2. sidenote: it makes things infinitley worse that more than half of this series was simulcasted and subbed by Anime Network Online, who love outdated ugly yellow fonted hard subs and insultingly poor translations. If Rinne is calling his mother ofukuro, you guys know you CAN translate that as just "mother" instead of just leaving it as ofukuro right? 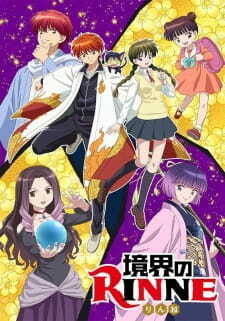 Kyoukai no Rinne (TV) 3rd Season adds to the delightful stories of Rokudo Rinne and Mamiya Sakura with its innovative, yet whimsical plot, and lovable characters. In this season, we continue to have conflict with Rokudo and Mamiya, as those around them shake up their everyday lives. If you enjoy slice-of-life anime, a bit of comedy and romance, then this is a more than suitable anime for you to watch. I gave this anime a 10 out of 10. Let's go over the components. This story is a 10 because while it is episodic, it does refer to past events, making it a nice balance between 1 main story and having side stories. Naturally there are ones that aren't part of the main story, but the pacing is slower and comedic, so they are enjoyable either way. Unlike other Shinigami stories, RIN-NE is more for families and young children, and lacks the gore that might be in other stories involving Shinigami. This is another reason to like this series if gore isn't your thing. Also, nothing is how it seems in this anime. You can always expect an interesting development! The art is a 10. It's bubbly, cute, and whimsical! Pleasant to look at, with what can be described as a sort of watercolour texture to the art. The sound I gave a 9 because some of the theme songs were a bit weird, but KEYTALK did a great job with their music. Their OP are fun and upbeat! The sound effects are always well- paced, well-placed for maximum comedic effect! The ending theme song Puzzle is a very lovely ED song! Characters are 10. Character development might not be obvious, but there is something going on there... Some of them are just plain wacky though! But a fun and lively cast is appropriate for this young main cast. Except for the otherworld, with Rinne's **grand**mother and the others being older. *note: was scolded for emphasising grandmother.